Gerard led the way as we traveled along a winding path, over hills, deep in the mountains of Burundi. We arrived at a production facility hidden among the trees of a dense palm forest. The air was thick with the rich smell of palm oil. Steam rose up from the ground and deep orange oil dripped off the forearms of the workers, each playing a different role in the production process. With pride, Gerard picked up a small brown seed and began explaining how he had finally managed to join the palm industry in his village. Large clusters of fruit are picked from trees and then separated from the bark like fiber that holds them together. The juicy palm fruits get pressed, releasing the oil and removing a brown seed. 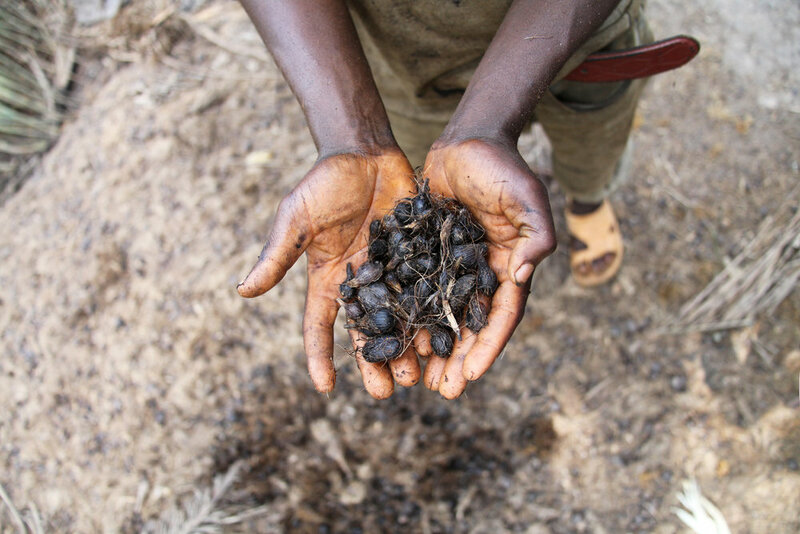 As the oil is refined, the inner seeds are dried in the sun and sold as a bi-product. A week ago, Gerard took out a $22 loan from his community savings and credit association to buy 8 small kegs of these palm seeds. Months before, Gerard heard that people in his village were collectively saving their money in an unfamiliar way. A group had come together to pool their savings each month, taking turns to receive the lump sum that was accumulated to use as capital infusion in their businesses. The idea of working together in this way was appealing, and Gerard joined them. The savings and credit association they had formed was called Terimbere, which means "Go Ahead" in Kirundi. He was excited to share ideas with group members and to have enough capital to start a new business. In the coming days, Gerard will break open the brown palm seeds with two rocks, revealing a chalky white layer. This portion will be ground down to a powder and re-sold to a soap factory for a profit. Gerard plans to reinvest the money into his new business, with the hope of eventually buying the palm fruit itself to produce palm oil rather than just palm seeds. Gerard supports his wife, Flora, daughter, Belyse, and mother, Genevieve. This new endeavor has given them all a better sense of security and newfound optimism for the future.